Wah! 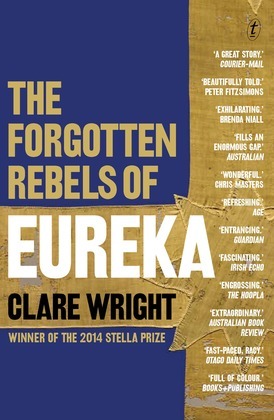 Once again I delayed reading a much heralded book until my reading group did it*, and so it is only now that I’ve read Clare Wright’s Stella Prize winning history, The forgotten rebels of Eureka. The trouble with coming late to a high-profile book is how to review it freshly. All I can do, really, is what I usually do, and that is write about an aspect or two that particularly interested me. Since other bloggers have already beautifully covered one of these, the history**, I’m going to focus on Wright’s writing and the approach she took to telling her story. I won’t be doing this from the angle of historical theory, as I’m not an historian, but in terms of her intention, and her tone, style, and structure. Women were there. They mined for gold and much else of economic value besides. They paid taxes. They fought for their rights. And they were killed in the crossfire of a nascent new order. Consequently, in her book, Wright draws on extensive primary and secondary sources to explore and expose the lives of these women and the until-now-unheralded role that she believes they played in the goldfields, particularly in the lead up to and aftermath of that fateful day of 3 December 1854. Wright opens the book with three epigraphs, one of which is particularly illuminating in terms of my subject. It’s by Australian historian Geoffrey Blainey and states that “every history of every country is a mirror of the author’s own interests and therefore selective rather than comprehensive”. Having been interested in historical writing since studying EH Carr’s What is history at university, I like the admission that histories are inherently subjective, regardless of how well researched they are. The historian makes decisions about what s/he will research, what the limits of that research will be, and how s/he will interpret that research. It’s common sense. How can it be otherwise? And so, in this history, Wright’s specific interest in the role of women means that all her research – even research into men’s activities – is viewed through that prism. There’s another implication, too, regarding selectivity: with her focus being specifically the women, we cannot read this book as a comprehensive history of the Eureka Stockade. It complements, or expands, or even jousts with other works. None of this is meant negatively. I thoroughly enjoyed the read. My point is simply that it’s important, as it always is, to be aware of what we are reading – and I like the fact that Wright recognises this. So, what we have here is, to the best of my knowledge, a thorough but selective history. The text is extensively referenced, with 25 pages of meaningful endnotes and nearly 20 pages of bibliography, and there is a useful index. These are things I look for in a good nonfiction work. The book is logically structured, by theme and chronology, and its (creatively titled) chapters are divided into three main parts: Transitions, Transformations and Transgressions. You can sense a writer’s touch in the alliteration here. The arrival of the extra troops meant squashing more stinky little fish into an already overpacked tin … From the outside, it seemed like the tightrope was about to snap. Her stories of the childbirth experiences of Sarah Skinner and Katherine Hancock are devastating to read. Indeed, I would place this book in the narrative non-fiction tradition. It has a strong narrative drive, with a large cast of characters, some of whom stay with us, some of whom pass through. They include Ellen Young whose poems and letters in the Ballarat Times articulate the mining community’s distress and sense of injustice; hotel-keeper Catherine Bentley who, with her husband, earns the ire of the diggers by consorting with government officials; theatre-owner and actor Sarah Hanmer who donated more to the rebels’ cause than anyone else; and newspaper publisher Clara Seekamp who takes the helm when her husband is arrested for sedition. These women provide significant evidence for Wright’s thesis that women played more than a helpmeet role in the intellectual and political life of Ballarat. repetition of ideas and motifs to propel her themes. Take, for example, the Southern Cross. It functions as “a hitching post for existential certainty when all else was in mortal flux” during immigrants’ sea journey from the northern hemisphere to the south (Ch. 3, “Crossing the line”) and is later picked up as a symbol for the rebels’ flag “as the one thing that united each and every resident of Ballarat” (Ch. 11, “Crossing the line (Reprise)”). As an historian, Wright is confident and fearless, expressing clear opinions, either as direct statements, or indirectly through her choice of language. She calls the Bentleys’ murder trial, for example, a “morality play”. She asks questions; she offers close analysis of her sources, such as noting that the use of the word “demand”, rather than “request” or “humbly pray”, conveys the diggers’ frustration with authority; and she makes considered deductions by testing textual evidence against her understanding of the times and the work of other historians. She discusses discrepancies in reportage, such as the different witness reports of the fire at the Bentleys’ hotel. But she also, as other bloggers and my own reading group have commented, draws a long bow when she suggests the full moon and menstrual synchrony may have been a factor in so many men leaving the stockade on the night of the attack. She provides some evidence for this synchrony as a phenomenon, and offers other reasons for the desertion, but it feels a little out of left field. At times her nod to the popular and her push for dramatic effect jars, but Wright’s argument that women played an active role at the diggings and in the stockade is convincing. I’m not surprised she won the Stella Prize, because this is engaging reading that is underpinned by extensive scholarship and clear thinking. It’s exciting to see a work that doesn’t just explore the role of women in history but that puts them right in the action. * I bet you can hardly wait until next month now! ** Do check out historian bloggers, the Resident Judge and Stumbling Through the Past, and litblogger Lisa of ANZLitLovers. Yours too, Lisa … it’s a book that invites engagement on different levels isn’t it? Wow that’s great! The world is changing. It feels very slow at times, but then when you compare something like that with even 10 years ago you can see some progress. At least I would imagine that would have been unlikely in the situation a decade ago? You’re in Hotham, eh? That’s rather apposite given the book. Yes very enjoyable review WG. I’m also reading a much-heralded masterpiece way after its appearance – Wolf Hall! And marvelling at the depth of the historical experience. Oh good, Catherine, I’m glad I’m not the only tardy reader around here. Wolf Hall is wonderful isn’t it? Great review as ever Sue. I’m perpetually coming to books late, and so know your fresh blogging difficulty very well. Ha ha Louise … So glad fellow tardies are outing themselves. It’s a good read … If you ever do get around to it. I’ll pass on this one as I rarely read historical novels. I think it’s a good idea to read bestsellers AFTER the pack to he honest. Let the heat die down, I say. Oh Guy … This isn’t an historical novel, it’s a history. I agree re best sellers, if I read them at all. Well, I’m not sure you’ve convinced me, Gums, that this is a book I’d like to read, though I’m sure of its worth. Frustrated that once again I can’t seem to comment on your comment on Charlotte again. Don’t know what it’s all about, but will endeavour to fix it again. Long response on similarities between FDR and Gough and why the former got 11 years in office and Gough got only three just disappeared. (At least I think FDR had eleven years – he was elected four times but died a year after the last one – so with four-year terms? … maths have never been my strong point.) But back to Clare Wright. I have trouble at times with what we could call the resurrectionist view of women’s history, though I realise it represents an important correction to the mainstream. But just as important, it seems to me, is for women writers generally, historians included, to write about men and what is usually considered their affairs. In other words, writing history or whatever, whether ‘women’s’ or not, through the prism of feminism. Maybe I’m wrong, maybe that’s what Wright has done. But why should women be restricted to writing about women? I think there’s a lot of that thinking afloat, even now. Hmmm … Not sure why you are having problems commenting on your own blog Sara … That’s weird. Wish I could offer some suggestions. As for Clare Wright, no I don’t think women should have to write women’s history but it’s partly a case of if they don’t do it, who will? To some degree, I see that where we are now is a “righting the balance” phase. That is, women have been generally excluded for so long that we need to unearth just what their role was and bring it into the light. Once it’s there and accepted, we can move to a more mature phase. There are parts of life now, where it’s generally accepted that women are there and where therefore no special notice is or needs to be taken. It just is. But I think in history, there’s still a lot to be fossicked out. Wright doesn’t show the women leading the stockade itself but she shows that they were active participants in the political and intellectual life of the diggings and made real contributions, practically and intellectually. The critical thing I think is where will the Eureka story go now. Yes, can certainly see the worth of this and I just made the point to show that there’s another way for women to participate in rethinking society. That is, writing and speaking about power, which so far is pretty much in male hands. If we restrict ourselves (and are restricted to) what women do or did that can be a trap in itself. Yes, Sara, that’s a good point. I certainly hope it’s not a case of women historians “being” restricted to. Clare Wright does show the power some of the women had. And she indicates the limits of that, how, when it came to the crunch, women’s suffrage for example got dropped in order to focus on the more winnable men’s suffrage! Or how women had to, felt they needed to, pull back when men returned to the reins (just like, I thought, what happens when men return from war). But, analysis of power is not the focus. It would be interesting as you suggest to tell the story from that particular perspective. The more I think about this, Sara, that is the idea of looking at it (this or any other history) from the point of view of power, the more I like it. It doesn’t negate what Wright has achieved but it suggests that she’s done the first stage and that having unearthed all she has, the information is there for further analysis from that more holistic perspective. 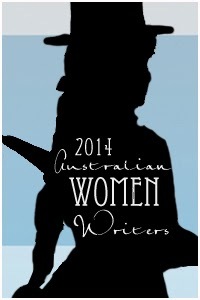 Sara, Australian women historians are prolific, mainstream historical writers. They certainly do not restrict themselves to ‘female’ topics – they write about everything, including war. Joan Beaumont’s Broken Years which was published last year has already won awards and is going to become one of the ‘must read’ comprehensive books about Australia’s experience during WWI for years to come, Women historians write about indigenous/settler conflict, convicts, political biographies etc. Women also write about masculinity, the best example in recent years is Melissa Bellanta’s Larrikins. i am writing a book about Australian masculinity on the front line during WWI and how this affected their expression of faith. I don’t know any Australian woman historian who feels that they must confine themselves to ‘feminine’ topics. That kind of attitude disappeared from the profession years ago. However, while women historians write about anything, I wonder if some male readers might still have a problem with reading war histories written by women? Thanks perkinsy … I was hoping you’d respond with your better knowledge. I think you’re second point speaks to Sara’s second point … What do men expect women to write and what will they read. And will men incorporate women’s roles and perspectives in their writing? I think it is important to have boys reading women authors at school to help avoid the sense that some men have that women are not worthy writers. On your second point, I have read male authors who write women well. I can’t think of them off the top of my head though! I have just finished reading Alan Atkinson’s recently published final volume in his Australian history series, Europeans in Australia. As in his other books he does not hesitate to focus at times on women. In my review I have list an article he has written in the book Australian History Now where Atkinson talks about the importance of his experience of marriage and how that helps him to write about marriage in history – not a traditional topic for a man..
By the way I found your review of Wright’s book valuable because of your discussion of the literary devices Wright uses. Thank you for putting in the effort to write a different review to others. I really enjoyed this book. It does show how women played their part in the Eureka Stockade. It is relevant to read of many people’s different experiences in any historical event. Clare Wright’s book gave me a clearer understanding of the events that occurred at the Eureka Stockade. Thanks Meg … I agree that it is always useful to read multiple perspectives, even when one claims to be comprehensive. Thanks perkinsy. I’m not thrilled with my review but with yours, and Janine’s and Lisa’s out there already, I didn’t want to go over old ground. I needed though to explore more the impact of those devices I think. But, still it’s a start. Yes, reading a history that works for someone who likes Australian literature does sum me up! Would love to read Atkinson – but my pile is tottering at present. Will keep it in mind. And yes, it sure would be good to see more boys reading women authors at school! Yes, I do too … And she’s done this well. I thoroughly enjoyed your review…& partly because you managed to mention the very same book I also read in my first history class at uni! What is history, revisionism, interpretation, lenses – they are all ideas I keep in the back of my mind with every non-fiction book I now read. Thanks Brona. I have no idea whether EH Carr is still read but he made a lot of sense to me – at least in the big picture of his ideas. Glad you liked my linking of the two books.